It�s finally here. This essential extension is designed to help you manage your customers quickly, efficiently and easily. Check our demo and be amazed. Manage the process from prospects to customers with the Customer Status. Choose from Lead, Customer, Prospect and many more. Adding customers has never been so easy, just click on Add Customer and add away with information like Twitter, Website and other important information you can build your database really quickly. And after you�ve built it, you can place a call, email the customer or place a new order. Make notes for the customers so you know what your last communication was about with the WooCommerce Customer Relationship Manager notes feature. WooCommerce Customer Relationship Manager allows you to place a completed call or a current call with a timer. You can log the call or even the email. 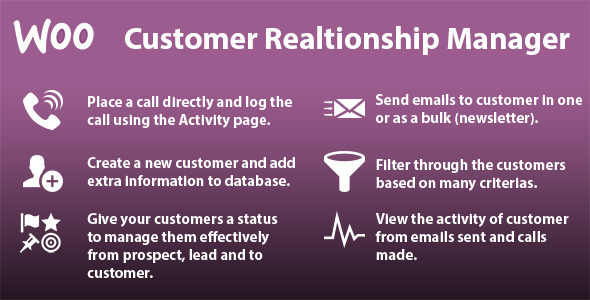 WooCommerce Customer Relationship Manager displays all your customers, including those that are guests so you won�t miss out on reaching out to anyone. Quickly filter through your database of customers based on their purchase history period, country or their names. The filtering system is very similar to the existing WooCommerce filtering system used on the Orders page ensuring that the ecosystem is coherent. Once you�ve applied your filter through your customers, you can quickly export the results simply by clicking on �Export Contacts� allowing you to get the most out of your extension. If you want to announce something quick to a small number of customers, just select the customers and then click on �Send E-mail�, it�s that easy. Using VoIP softwares or SIP phones such as Skype or Microsoft Communicator, placing phone calls has never been so easy. All you need to do is click on �Call Customer� action button and voila, the call is made. Viewing the orders placed by the customer has been made even easier. Find the customer and then click on �View Orders� action button. It will take you to the Orders page with the customer filtered for you. Note: still yet to support Network installations. 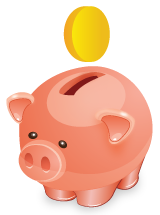 View your customers financial activity at your store at a glance. View their total spent, when the last time they spent and when they first spent their money at your store. Check if your customers have enrolled in your newsletter via MailChimp. No third party extension is required. Just put in your API key (which you can get from MailChimp) and you�re set to go. Feature added where you can filter between users and guests. Feature added where you can filter for last 24 hours. Tweak for font icons in action buttions. 2.0.x support has gone. Fix bugs of adding notes 2.1 issue. Fix bugs of linking variations 2.1 issue. Feature email logs are now displayed.